Reverse Osmosis (RO) Water? I'd put it on my windows but wouldn't drink it. At a recent Health and Wellness Convention on the Isle of Wight (where "we can rent a cottage.. if it's not too dear." Lennon & McCartney) organised by my Nikken colleague Ursula Dowd I was asked an unusual question - Would the Nikken Pimag Water system produce suitable water for my window cleaning business? I wasn't sure but suspected not given the tank is only 5 litres and in any case thought that using the delicious health giving #Pimag water for your windows would be an awful waste. The questioner went on to explain that he currently used Reverse Osmosis Water as this gave the cleanest results. I had no idea that window cleaning was so technical but apparently if you don't filter the water supply the dissolved solids in the water will leave patchy results when the windows dry. RO takes out all the particles giving the "purest" water possible. But what about drinking this industrially treated water? There are RO systems for home use but they have some significant drawbacks. They require plugging into the electricity supply and plumbing, and waste obscene amounts of water - many systems only produce 1 litre of drinking water for every 5 litres of tap water (an 80% waste!). The filtering process is also very slow and this can be frustrating if you want to fill your kettle right now. But the biggest problem with RO water is it sure takes out everything - it takes out all the goodness too. It is effectively dead acidic water with all the bad bits AND the health giving minerals removed. Some water filtering systems not only take out the bad stuff... they take out all the good stuff too. 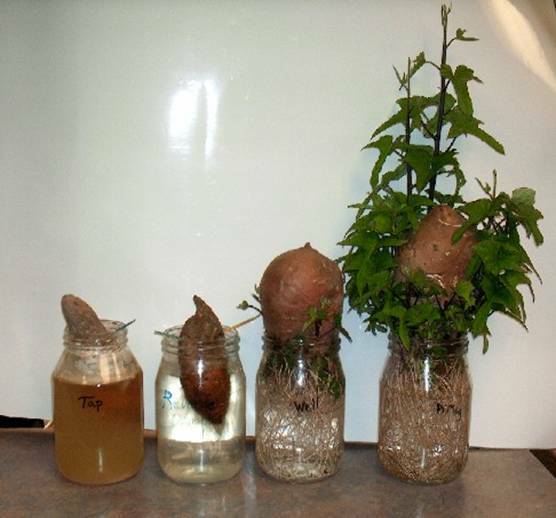 You may have seen the photo below before - it's been doing the rounds on the internet for a few years and shows the effects of different waters on a sweet potato after 5 weeks. The potato placed in the RO water (2nd from the left) looks as dead as the one in Tap Water (far left). The Nikken Pimag one is on the right. This is life giving water and will certainly put hairs on your chest!